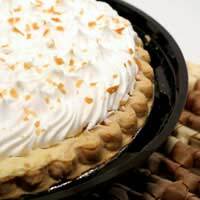 Cream pies really are an indulgence but there’s no reason why they have to be full of sugar as well. Both these recipes call for sugar free jam as a replacement. Try to find a sugar free jam that has been sweetened naturally with either apple, apricot or grape juice.Both these dishes are also best served cold. Those looking for a real treat can top them up with a little more whipped cream on the plate or can serve them with sugar free ice cream. Unless you are especially adept, it’s probably best to buy ready made filo pastry for this dish. Do remember to check the label to ensure it does not contain sugar. There are plenty of versions available in supermarkets and other stores that should be fine. Preheat your oven to 200 deg C/400 deg F/gas mark six. Take your butter and melt it gently in a small pan. Then take a baking sheet and grease it. Brush each sheet of filo pastry with melted butter then lay them on the baking tray so that it is completely covered. You should have used about half of your pastry. Place your apricot jam and vanilla essence in a saucepan and melt slowly. Meanwhile, beat your eggs then blend together with your ground almonds and cream. Pour in your melted jam mixture then whiz with a hand blender. Carefully pour the liquid over the filo pastry lining the bottom of your baking tray. Then take the remaining sheets of pastry, brush them with butter and place them on the top, creating a cover. Sprinkle with flakes of almond. Bake in the centre of the oven for about an hour or until the pastry is golden brown and the cream filling is firm. Remove from the heat, allow to cool then serve with more cream or sugar free ice-cream. Try to find sugar free digestive biscuits to use in your base for this cream pie. If not, create a base using wholemeal flour, melted butter and a little cinnamon. Preheat your oven to 200 deg C/400 deg F/gas mark six. Place your sugar free digestive biscuits in a bag then crush with a rolling pin. Place your butter in a medium sized saucepan and melt. Add the crushed biscuits and cinnamon and stir well. Grease a 22" cake tin then press the mixture into the bottom using the back of a spoon. Place in the fridge to chill. In a large bowl, beat your eggs then stir in your fresh cream. Squeeze the juice from your limes and lemon, and grate the zest from three limes. Place the juice, zest and sugar free jam in a pan and melt over a lower heat. Stir the warm liquid into the cream and egg. Take the tin from the fridge and pour all the liquid on to the base. Place in the oven and bake for about 15 to 20 minutes, checking all the time. The pie is ready when the filling begins to firm. Remove from the heat. Allow to cool and then chill before serving.